The staff was professional and very nice. Dr Jan was thorough and polite. This was my first appointment but it seemslike a good fit for me. The staff was professional and very nice. Dr Jan was thorough and polite. This was my first appointment but it seems like a good fit for me. Front staff members were very welcoming and pleasant. There was no wait time. The assistant was knowledgeable friendly.Images were taken of my teeth condition before and after treatment with Dr. Janbakhsh, which I greatly appreciated as it demonstrated her capabilities but also her desire to educate the patient My initial encounter with Dr. Hanbakhsh and her team was astounding! I look forward to continuing my dental care with her and referring to my loved ones. Highly recommend. Front staff members were very welcoming and pleasant. There was no wait time. The assistant was knowledgeable friendly. Images were taken of my teeth condition before and after treatmentwith Dr. Janbakhsh, which I greatly appreciated as it demonstrated her capabilities but also her desire to educate the patient My initial encounter with Dr. Hanbakhsh and her team was astounding! I look forward to continuing my dental care with her and referring to my loved ones. Highly recommend. Dr. Janbakhsh believes that learning is a lifelong process therefore continuing education in cutting edge dentistry is an important part of her life and has completed hundreds of hours with several dental institutes. Dr. Michelle Janbakhsh received her B.S. in Microbiology and her M.S. in Molecular Biology and has worked at NIH (National Institute of Health) and other biotechnology companies as a research scientist. Dr. Janbakhsh became interested in dentistry and holistic approach over 20 years ago while she was a patient of Dr. McClure in his holistic dental practice. Several years after working as a scientist, due to her interest in science and art and her passion in the holistic approach, Dr. Janbakhsh chose to attend dental school. University of Maryland at College Park, M.S. in Molecular Biology Howard University School of Dentistry, Dean's List, Washington, DC, 2001 Advanced General Dentistry residency at the University Of Maryland School Of Dentistry Las Vegas Institute (LVI) for Advanced Dental Studies Member of AGD, HDA, IAOMT, IABDM, and ILADS Awarded the American Top Dentist Award consistently since 2008 by the Consumer Research Council of America Dr. Janbakhsh has a special interest in children and adult orthodontics, cosmetic dentistry, neuromuscular dentistry, orthopedics and Invisalign. 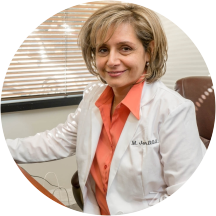 Due to her holistic approach, Dr. Janbakhsh uses safe and biocompatible materials and treats the whole body. Christine (Dental Hygienist) and Dr. Jan were very thorough and polite! I went in for a Dental Cleaning and it's the best one I've ever experienced. I highly recommend paying them a visit. I also appreciate how Christine and Dr. Janexplained everything before beginning my cleaning; Dr. Jan sat down with me and reviewed the pictures of my teeth pre-cleaning to show me what was being removed. Once again, I highly recommend! Dr. Janbakhsh and her assistants were very kind. The wait was not long, and they all treated me respectfully. The service I got from Ms Janbakhah is excellent and first class. With holistic dental care from Ms Janbakhah, my teeth's health is improving. I received less Invasive treatment but high improvement of dental health. I highly recommend Dr Janbakhah to my friends and families! Extremely professional office staff and doctor. Highly recommended! The best dentist I've ever been to! Always thorough and procedure details explained. Always pain free. Dr. Jan is always concerned about you and makes sure you're doing fine during the treatment....as far as dental work.... It doesn't get better than this. This is my second visit with Dr. Jan and I am so happy with her and her staff. As a single mother of two with a full time job, the hours are great and cater to my busy schedule. Molly isvery attentive and follows up great. Dr. Jan worked on a plan with me to get me a healthy and happy smile and Consuelo walks me through everything going on. They are a great team! As always, Dr. Jan, Molly, Consuela, and the whole crew at Modern Smile made this appointment as wonderful as a trip to the dentist can be! I almost wish I could get more cavities, so I can keep going back! I love this office! There is almost never any wait at all, and I'm always there less than an hour. The people who work there are very nice and as someone who really hates the dentist, this office is the best I have been to so far. I am very satisfied with the level of care I received from Dr. Jan. She is an outstanding dentist and person. What's most important, she cares about people and environment! She is very knowledgeable and professional. I would recommend seeing her to anyone ! Dr. Jan and everyone at Modern Smile are truly wonderful. I'll be going exclusively to them for as long as I have teeth! She's quick, and does a lot of the work herself. I have only seen one Dental Assistant there but I never have to wait too long. And even with my insurance, I was charged much less at this office than other places for filling cavities. Received compassionate, competent care. Looking forward to the next visit. Great staff and Dr. Janbakhsh not only treats you like a patient, but takes the time to educate you and greets you with a smile every time. Wonderful atmosphere. She's an excellent dentist, and makes the whole process smooth and easy. I would recommend her a million times over. Dr. Janbakhsh has been my dentist since I moved into the DC area bout 4 years ago. She has helped me through some scary dental issues. She is highly professional, always updating her knowledge and balances it all with a 'greatbedside manner'. She treats me more like a friend than a patient. I would and have highly recommended her to my friends. It was very Nice and Pleasant. Absolutely no pain. Even from the initial shot. I don't know how she does it - but she does. Also, her entire staff is great, personable, and kind. She's wonderful! Hardly any wait time, very knowledgable. Actually looking forward to my next tooth cleaning! Only recently learned about holistic dentistry and are very happy a good friend recommended Dr. Jan. Really appreciated the time she took to answer questions about our dental treatment needs and addressing them with a holistic approach. Office staff also very friendly and helpful. Dr. Janbakhsh was very gentle with everything she did for me. A great experience. She discussed my upcoming treatment with me, and I understand everything. Thanks. Very knowledgable and friendly. Went there for a second opinion and she was very strait forward with me and told me that I didn't need some of the services I was told I needed at another dentist.